Welcome to The Abso!ute Sound online! We explore music and the reproduction of music in the home. We believe that the sound of music, unamplified, occurring in a real space is a philosophic absolute against which we may judge the performance of devices designed to reproduce music. Our goal is to provide the resources consumers need to judge how a component's sound either honors or departs from the music's truth, and to make sound purchasing decisions that maximize their experience of reproduced sound. Below is our Issue 157, December 2005 table of contents and editorial. Neil Gader listens to the latest digital player from a company known for its beautiful, musically refined components. Here 'tis, the biggie -- our annual roundup of the crème dela crème of high-end audio. Arnie Williams listens to and reports on a new model from Revel at a very competitive price point. This highly resolving and seductive speaker finds Jim Hannon pondering the recent popularity of German manufacturers in the U.S.
Sue Kraft checks out the latest from Canadian designer Israel Blume. In the first part of a survey intended to find musical multichannel controllers, Alan Taffel explores Rotel's RSP-1098 and McIntosh's MX-119, with further thoughts on the Aesthetix Calypso linestage. Jonathan Valin takes a listen to a pair of beastly expensive and beautiful-sounding cables from designer Matthew Bond. 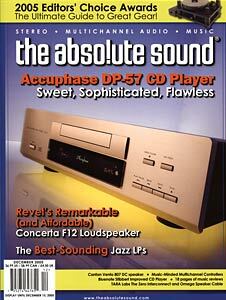 The Bluenote Stibbert Improved CD Player; The Super SACD Sampler; The Perils of Reviewing; Of Turntables and Speed; Follow-up -- the ASR Emitter II Exclusive, Version 2005. In the third installment of an ongoing series of great and great-sounding music, Fred Kaplan chooses the very-best-sounding jazz platters. Harmonia Mundi's Saul, Cecilia Bartoli's risqué Opera Proibita, Kronos Quartet's venture into Bollywood, Phillip Glass' Orion, Joshua Bell on Tchaikovsky, plus six recent SACDs covered. 22 CDs, LPs, and new-format discs reviewed, including the latest from Neil Young, Fiery Furnaces, Death Cab for Cutie, The Dirty Three, Bettye LaVette, Dangerdoom, Boubacar Traore, Freakwater, Paul McCartney, Rolling Stones, Eric Clapton, and Amy Rigby. A previously lost gem from Thelonious Monk and John Coltrane, plus new sounds from James Carter, Common Ground, Bill Frisell, John Scofield, Jenny Scheinman, and more. Addams Family Audio Research, by Wayne Garcia.